Oceanflow's E35 device was installed on its pre-laid moorings at Sanda Sound on the 7th August 2014. The Sanda Sound test site was chosen for its combination of strong tidal flow and harsh wave climate in order to fully validate the operability and survivability of the Evopod™ low motion hull form. 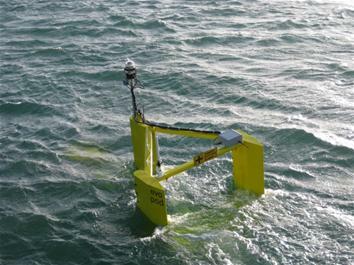 The unit was monitored from Oceanflow's shore station near Southend, South Kintyre. Pennyseorach, Southend, Argyll & Bute, Glasgow, Scotland. The device is extends 4 m into the water at 22 m water depth in Sandra Sound. In March 2017 Ocean Flow Energy decided to cease its tidal testing programme at Sanda Sound due to a lack of research funding. The reason behind the decision lies in difficulties to secure the research funding to continue the testing at Sanda Sound, according to Graeme Mackie, Ocean Flow Energy’s Managing Director. Ocean Flow Energy has received the approval for its decommissioning program at Sanda Sound site from the Department of Business, Energy and Industrial Strategy (BEIS). The move follows the removal of the E35 turbine in 2015, and the liquidation of its Scottish project company Oceanflow Development in December 2016. All licensing for Marine Renewables in Scotland is coordinated and administered by Marine Scotland, a department of the Scottish Government. The seabed on which a marine renewables installation is located is leased through The Crown Estate. Potential collisions between turbine blades and diving birds, marine mammals. Effect of seabed cable on migratory species and other electro-sensitive species. Ocean Flow Energy - Sanda Sound is located in United Kingdom. Digital flowmeter measurements from vessel. Video footage obtained with inspection ROV. Biotype, species list and abundance. Vantage point survey and AIS data. Pre- and post-installation comparative analysis.